Performers include: Ricardo Montalban, Herve Villechaize, Wendy Schaal, and Christopher Hewett. 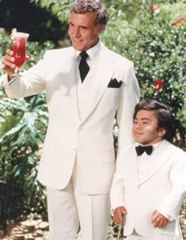 A popular drama series that takes place on a unique vacation spot known as Fantasy Island. Guests come to the mysterious island to live out their individual fantasies, often with unexpected results that teach them something about themselves. Their mysterious and benevolent host is the white-suited Mr. Roarke (Ricardo Montalban) who seems to have extraordinary or supernatural powers. He is assisted by the energetic and diminutive Tattoo (Herve Villechaize) who, among other things, announces the arrival of new guests.